Do you believe in second chances? Real Dogs Don’t Whisper book is about second chances and miracles. 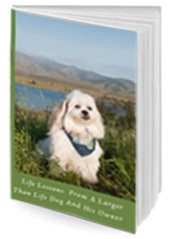 Read about how four rescue dogs that were ready to be given up on because they have special needs; teach their human about life; how to believe in hope; how to accept and give love; and, so much more. Kelly, Mr. MaGoo, Buffy, Carla Mae, and Betty Boop. A girl, her two Lhasa Apsos, one Cocker Spaniel, and one adorable mutt – each with their own challenging set of difficulties to overcome. One puppy has serious neurological disorders. Two were severely abused. All are on a journey of discovery. Together, learning love and patience along the way, they have grown and thrived. And perhaps none so much as the girl.